Where can I buy the pop-up objects? 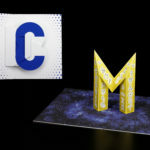 Where can I find free tutorials for pop-up cards? How can I learn to create my own pop-up cards? Can we commission you for our project? How long does it take to design a pop-up card? How much costs the design of a pop-up card? How are pop-up cards produced in series? 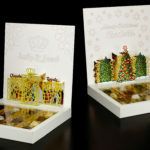 How long takes the serial production of pop-up cards? Do you use a computer to design your pop-up artworks? Which paper / which cardboard is best suitable for the construction of pop-ups? Which adhesive is best suitable for the construction of pop-ups? I have a question that is not listed here. How can I contact you? When I am presenting pop-up cards that I have designed for commercial sale, (e.g. birthday cards or Christmas cards for publishing companies), you will find the link to the manufacturer, the dealer or the online shop directly in my text – on the same page, where you have discovered the photos. If you can not find a link to a shop there, the design is probably not available on the open market. I am often commissioned by customers to develop exclusive designs (e.g. invitation cards for a special event). In such cases, I sell the license for the use of my designs exclusively to my customers. A sale of these designs to third parties is usually not possible. If you have questions, please contact my customer directly. The link to their website can be found usually on the same page on which I present the customer project. I originally designed many of my paper artworks as single pieces. But due to high demand, since some years I decided to create them in a small edition. The total number is strictly limited to 20 copies per motif. I create these artworks only personally and only on order. Each paper object is signed and numbered. Some of my paper sculptures have already been sold to museums and to private collectors. If you have a serious interest in acquiring one of my paper objects, please do not hesitate to contact me. 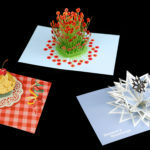 Even if you can not buy these pop-up cards as finished products – you can create them yourself! You can find a list of all available free instructions here: Tutorials. Please note that my instructions may be used only for private use. Any commercial use is prohibited. 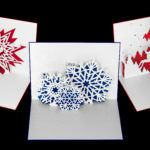 By clicking on the following link you will find some free instructions for pop-up cards that I designed: Tutorials. Please note that my instructions may be used only for private, non-commercial use. I myself acquired most of my knowledge by hours and hours of practical experience with paper. In my view you learn best and fastest through trial and error. I would highly recommend it to everyone: Work as much as possible with paper. In this way you will learn most about the creation of paper artworks. Furthermore, there are many books in which pop-up techniques are explained. You will find some book recommendations on my Facebook list: Link-collection (Facebook Page) Don’t forget to click on the “show previous comments – button“, because the list contains even more entries, than you can see at first sight. Do you have a specific design idea – or is there some artistic license? Shall the pop-up card be colored or shall it remain unprinted? Do you want to apply illustrations or photographs? Can you provide plans (e.g. architectural drawings)? 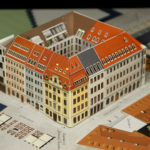 This is particularly important if you want to create an architectural model. How many copies are required – or shall the pop-up remain a single piece (e.g. a stage set)? What is your preferred date at which the design has to be finished? Etc. – The more information you give me, the better. The time that is needed from the very first sketch to the final prototype (ready for production) depends primarily on the complexity of the design. 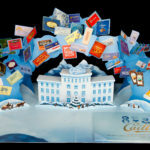 Usually, I can create a rather “simple” pop-up card within a few days – but I have also worked on very elaborate models which kept me busy for weeks. In addition, enough time must be planned for meetings and coordination with the customer, as well as for corrections and changes. Even the delivery of models to customers via post or courier needs some days. Finally, it also depends on my current order situation, whether I can immediately give attention to the new project, or whether I have to finish an existing order before I can start to work on the new project. The average time from the first customer inquiry to final draft usually needs about four to eight weeks. Elaborate projects sometimes have a processing time of several months. The production time – for example the production of a series of greeting cards, or the making of an exhibition stand – is not included in this estimation. The costs are based on different criteria. The most important criterion is the effort that is needed to design a pop-up card with the desired effect. It plays a role, for example, if color illustrations are to be made, or whether the draft shall remain white (unprinted). Moreover, it is important to agree on the extent to which the client wants to use the design. One-time use in a small edition (e.g. an invitation card for a single occasion) is cheaper than unrestricted use, e.g. a draft which shall be marketed worldwide and unlimited in time. Unfortunately, it is impossible to give a general answer. Are you planning a specific project? Then please contact me and tell me more about your ideas. I will be happy to make you an offer. I myself have no card manufacturing company. My business is the design of prototypes, including the creation all data that is needed for mass production and / or for implementation by booth building companies. Of course, I may recommend suitable companies for serial production. The serial production of pop-up cards is mostly carried out by specialized companies (card manufacturers, printing companies). The “classical” production process is as follows: The designer provides a model and data of his design (printing data and data for the stamping die mold) to the production company. The illustrations are printed on the paper – by digital printing, offset printing or by the use of other print technologies – e.g. letterpress printing (embossed printing), screen printing, etc. In addition, print finishings are possible, e.g. embossings, gold or silver effects, varnishing effects, etc. The vector data is used to create a “classical” die cutting tool (made from steel and wood) or the data is processed digitally. The finished printed sheets are then inserted either into a punching machine or into a laser cutting system. There, the items for the pop-up cards are punched out or cut by a laser. These component parts must now be assembled by hand to produce pop-up cards. The folding and gluing of the individual parts can not be executed by a machine, it is always done manually. Many manufacturers assign these tasks to external service providers. Some companies are also cooperating with workshops for handicapped people who specialize in such paper works. The large amount of manual work makes the production of pop-up books and pop-up cards very time consuming. Even for a small print run of about 2000 cards a production time of at least 3 – 4 weeks should be scheduled. For the production of more copies, you should schedule accordingly more time. I always develop my first models by hand – in the same way, like I did it more than 25 years ago – without using a computer. I don’t make sketches with a pencil, but I start immediately to build models from paper and cardboard (card stock). My first models are always very simple. In every additional step I add more components or folds. Little by little, this results in the creation of very complex structures. Often, I have to build several models to test different solutions. As soon as my paper model is operating properly, respectively if I have received the desired effect, I divide it again into its individual parts. I scan each element with a scanner. Only now my computer is used. I draw the outlines of the pop up elements according to the scans with a vector graphics software (Adobe Illustrator). Now I optimize the vector data on my computer. I can adjust each cutting line or folding line by the fraction of a millimeter. Furthermore, I can add new elements, e.g. curlicues or other decorations. To test my data, I send it to a cutting machine (a cutting plotter), which cuts the individual elements from paper or card stock. If everything works properly, I create a final model and send it to my customer with the request for approval. A general answer is unfortunately not possible. The selection of the best material depends on the desired effect and the size of the model. For the illustration of “flexible” motifs, such as petals or butterfly wings, paper with a weight between 160 and 180 g/m² might be suitable. 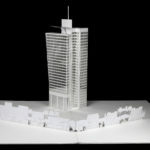 But for the creation of architectural models, usually more sturdiness is needed. For such motifs, I often use thin but sturdy cardboard (card stock) with a weight between 200 and 260 g/m². 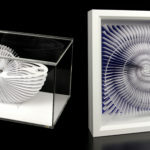 The best material for packaging or for large pop-up sculptures might also be significantly stronger and heavier. For some of my larger pop-up sculptures with dimensions of approximately 140 x 100 cm, micro-corrugated cardboard (so-called Micro Flute) with a thickness of about 1 mm thickness was used. For early sketches and for the creation of simple models it is usually not necessary to use special papers or special cardboard. If you want to create your own pop-ups, you can also use drawing paper, card stock, or even remnants of packaging (e.g. empty chocolate boxes) for your first sketches. For your final model, you may then buy only a few sheets of paper (card stock) in the required quality, for example in a craft store or in a print shop. The range of papers is so extensive that it is impossible to recommend a particular variety. Again, I recommend to find out the best solution by your own tests. Everything is possible – double-sided tape, glue rollers, glue sticks, liquid glue, glue dots – surely everyone has their personal preferences. I can’t recommend a certain variety or brand. Basically, it is advantageous if the adhesive is acid free. So you can be sure that the paper does not discolor at the splices even after many years. Of course it is important, that the adhesive sticks permanently. Test the adhesives with the original materials (paper, cardboard, corrugated cardboard, etc.) that you want to use. I recommend to control the splices again after a few days. Some adhesives become stronger after a few days, other adhesives react with the surfaces and detach after some time. You will find the best results by making your own tests.